I’ve been plugged into the writing community for years and have wondered if it’s worth my time, attending writing conferences, taking classes at Grub Street Creative Writing Center, and reading the trades magazines. I’ve spent hours scouring the “calls for submissions” in the back of Poets and Writers magazine and the online site NewPages.com, looking for places where I could submit my writing. After spending an afternoon with writer and poet Jina Ortiz, I’ve come to a conclusion about the worth of my efforts. 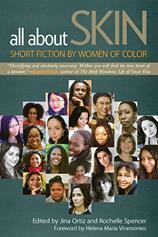 Jina is co-editor of All About Skin: Short Fiction by Women of Color, one of the most talked about anthologies. The volume features 27 stories by women of color whose short fiction has earned them a range of honors, from the Guggenheim Fellowship, to inclusion in The Best American Short Stories and the O. Henry Anthologies. All About Skin was given a favorable review in a recent issue of Ms. Magazine and a lengthy write-up in Poets and Writers. I’ve known Jina for years and got her to agree to be the speaker at my book club meeting recently. I asked her about the submission process for the anthology. She said that she and co-editor Rochelle Spencer received more than 100 submissions, which they whittled down to 27. She said they sought stories from authors they knew, put out an open call through writing networks, including writing publications, and attended writing conferences, where they solicited work. While being plugged into the writing network is time-consuming, I believe it is worth it. The writers whose stories appear in All About Skin now have another high-profile platform to showcase their work. The volume is being looked at by some universities to be included as a textbook. This entry was posted in Book Club, Book signing, Publishing, Writing and tagged All About Skin, anthology, feminist, Jina Ortiz, Ms. Magazine, Rochelle Spencer. Bookmark the permalink.